The fourth in a series of drone releases based on voices provided by various stillstream denizens. Including the voices of Crystal Dreams as The Caterpillar, Pixyblink as Alice, Altocumulus as The Queen of Hearts, Disturbed Earth as The Mad Hatter and Rebekkah Hilgraves as The Duchess, The White Rabbit, and Bill the Lizard. 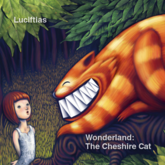 And featuring Har as The Cheshire Cat. Thank you all for participating and lending your voices to the project.